Here is a recent thrift shop purchase, a vintage child's chair. It's legs are metal and the seat and back are wood. It is in fairly tough shape, but I think I can perform some makeover magic on it! 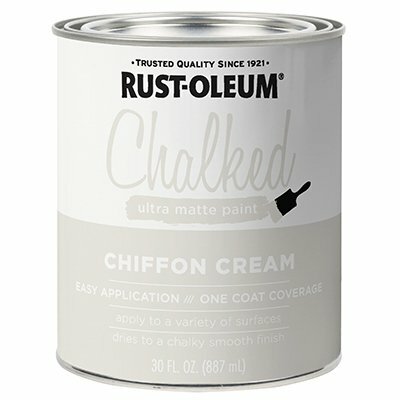 After giving it a good cleaning, I brushed on some Zinsser Clear Shellac , mainly on stained areas and rusty areas so I didn't get bleed through on my chalk paint. 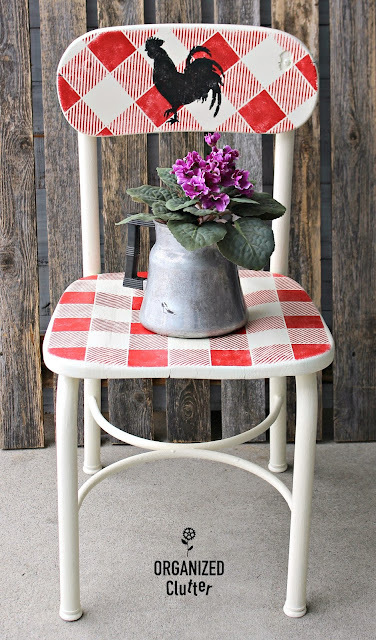 I then painted the chair with two coats of Chalked Chiffon Cream Paint. 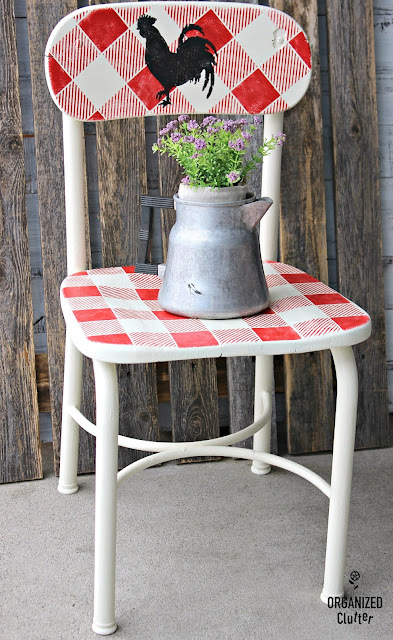 Chalked is a cheaper alternative to Annie Sloan Chalk Paint, and works very well. After the Chalked Paint was dry, I pulled out my trusty *Old Sign Stencils Buffalo Check Stencil. If you haven't purchased this stencil yet, maybe this chair project will give you the extra push! I stenciled the checks with Deco Art Chalky Finish Paint in Rouge and a Dreamweaver Stencil Brush. Next I used this Hobby Lobby stencil to add the rooster silhouette with black Ceramcoat craft paint. I didn't distress the chair at all. It looked so clean and fresh. My last step was to seal the paint with Ultra Matte Interior Chalked Paint Clear Sealer . 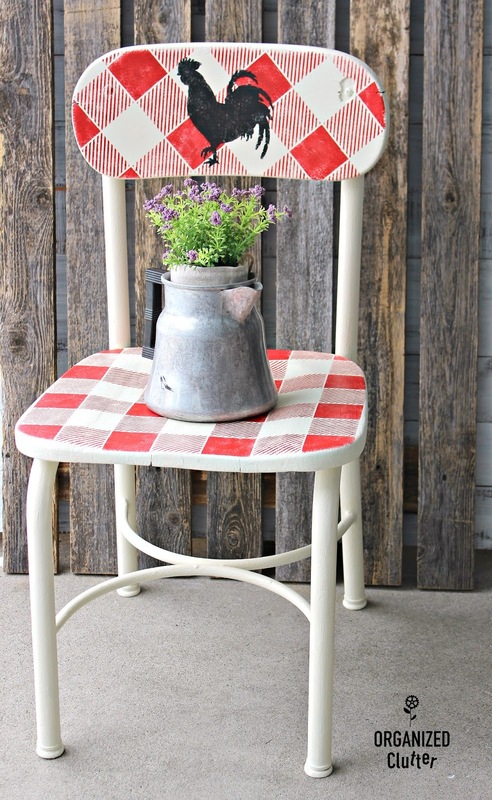 When I first stenciled it with red paint, I immediately thought I would make it a Valentine's Day project, but changed my mind pretty quickly. This cute little piece has to work year round! Don't the checks remind you of a farmhouse red checked tablecloth? I can picture this little chair on my covered patio this summer, safe from the rain, and holding a plant! 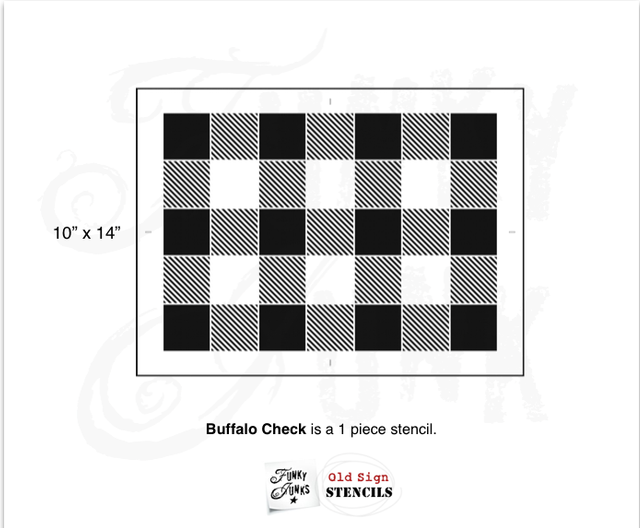 Find a little chair, and get the buffalo check stencil! You may not use it as much as I do, but you will find many uses! How cute is that. Fabulous makeover. Carlene, this is adorable! 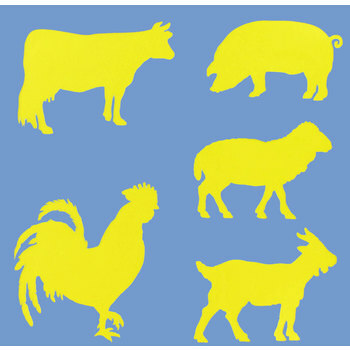 Love the rooster and you know I love the buffalo check. 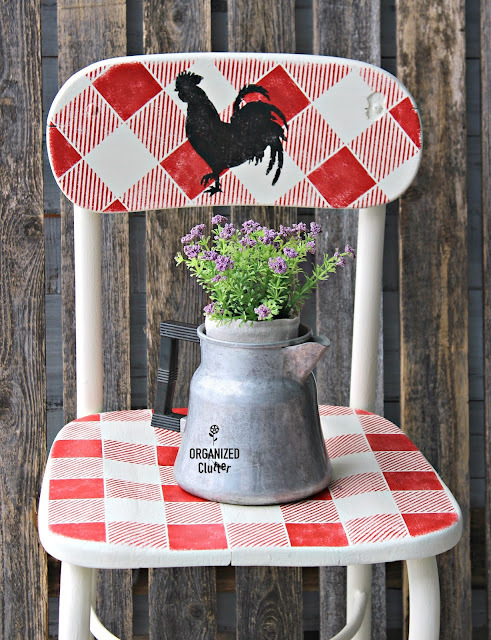 :) Funny, I just played with the buffalo check stencil using red paint and an old ceiling fan blade. Not sure what I'll put on it yet but the black paint is perfect. Thanks for sharing such a cute project and inspiration. I like this one too! I saw it on Instagram first. Hey, I wanted to ask you something I have been thinking about. You have a following over here in central WI. Could you reply to this, so I can ask you something. Thanks. How cute is this! I Love it Carlene! I have the same stencil and use it over and over. The possibilities are endless!